Podcast #15: The Toughest Man in the World (1984) | Why Does It Exist? A picture is worth a thousand words, and none of those are The Toughest Man in the World. 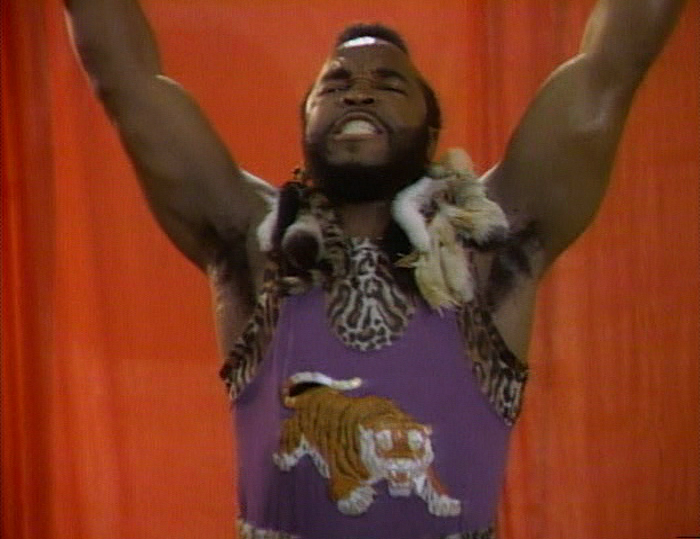 Justin Bieber is pretty much the Mr. T of 2012, right? This is an undisputable fact. What Bieber maybe isn’t, though, is The Toughest Man in the World, a title that apparently belonged to the elusive Mr. T in this 1984 TV movie. T plays a tough but fair basketball coach who’s forced to perform in a strength competition in order to save the rec center from blah blah blah blah. Lots of fight scenes, pickle-chucking action, kids that dress like Alex, Mr. T in short shorts, a prominent role for Dan’s idol, Dennis ‘Big Daddy’ Dugan, and wholesome fun for the whole family! We also unveil our first ever listener email and explore the new sensations that it gives Dan in his fancy pants. Featured this week is the track LonelyAcorn by Charlotte Cornfield off her album Two Horses. She is currently on an extensive tour of the USA and Canada, check out the dates here.